Leukoerythroblastic anemia is seen in patients with megaloblastic anemia, septicemia, acute hemolysis, hypersplenism, disseminated intravascular coagulation, myelofibrosis or bone marrow infiltrative disorders. We present a patient with a rare cause of leukoerythroblastic anemia which was first diagnosed on bone marrow examination. A 30-year-old woman presented with fatigue and vomiting on and off since one month. She was diagnosed to have chronic renal failure two years ago and was on regular hemodialysis. An ultrasonogram showed only one visualized shrunken echogenic kidney with extensive calcification. There was no history of joint pains or family history of similar illness. She had developed refractoriness to erythropoietin injections since the last two months. On examination, she was pale. Spleen was palpable 5 cm below the left costal margin. There was no jaundice, lymphadenopathy or hepatomegaly. Complete blood count showed hemoglobin of 5.2 gm/dl, total leukocyte count of 3800/ mm3 and normal platelet count. Differential leukocyte count and peripheral blood smear showed leukoerythroblastic anemia. Biochemical tests showed raised blood urea (103 mg/dl), serum creatinine (6.9 mg%) and lactate dehydrogenase (717 IU/l). Liver function tests and serum uric acid was normal. Bone marrow aspiration was a dry tap with poorly cellular touch smears. 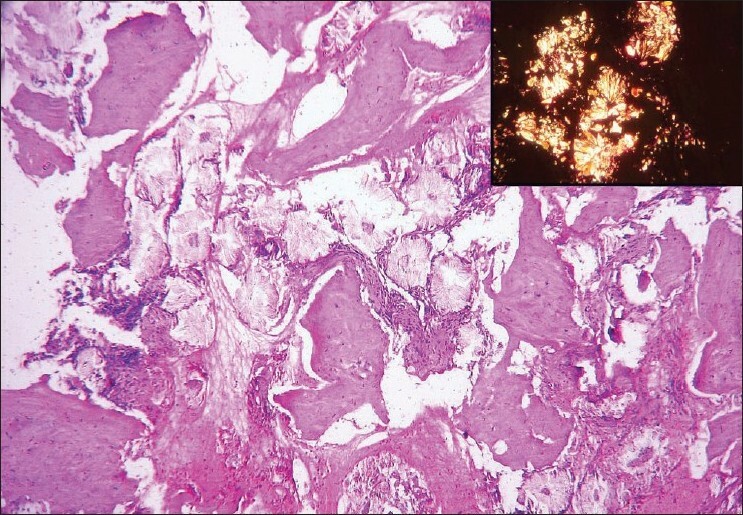 The trephine biopsy showed replacement of the marrow space by radially arranged aggregates of grey-yellow crystals [Figure 1] with surrounding fibrosis, few ill-defined granulomas and scanty residual hematopoietic tissue. The crystals were birefringent when viewed under polarized light. A diagnosis of systemic primary oxalosis was made in view of characteristic morphology of crystals, renal involvement and no dietary history favoring secondary oxalosis. She continued hemodialysis for 6 months following diagnosis and was then lost to follow up. To conclude, the possibility of systemic oxalosis must be considered in a young patient with unexplained renal failure, splenomegaly and leukoerythroblastic anemia. 1. Mehta AB, Hoffbrand AV. Haematological aspects of systemic disease. In: Hoffbrand AV, Catovsky D, Tuddenham EG, editors. Postgraduate haematology. 5th ed. Oxford: Blackwell Publishing; 2005. p. 965-78. 2. Toussaint C, De Pauw L. Primary oxaluria. Nephrologie 1995;16:399-406. 3. Walter MJ, Dang CV. Pancytopenia secondary to oxalosis in a 23-year-old woman. Blood 1998;91:4394. 4. Halil O, Farringdon K. Oxalosis: an unusual cause of leucoerythroblastic anemia. Br J Haematol 2003;122:2. 5. Cochat P, Gaulier JM, Koch Nogueira PC, Feber J, Jamieson NV, Rolland MO, et al. Combined liver-kidney transplantation in primary hyperoxaluria type 1. Eur J Pediatr 1999;158: S75-S80.